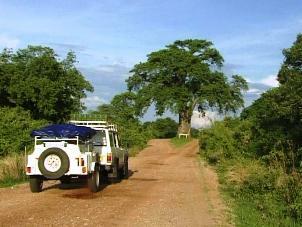 Makuti to Mana Pools Zimbabwe - Road conditions. At the town of Makuti, situated high on Zambezi Escarpment, you need to fill up your tanks as there are no petrol or diesel available in Mana Pools National Park. This is also a good time to do some last minute shopping or to enjoy an ice-cold beer at the hotel. 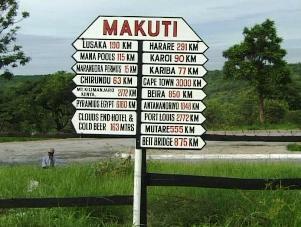 16 Km from Makuti on your way to Zambia you will reach the National Parks office situated at Marongora. All visitors to the Zambezi Valley must obtain an entry permit here. You won't be allowed into the reserve without it. The view onto the Zambezi Valley from the top of the escarpment is magnificent and on a clear day you can see forever. Descending the winding pass to the foot of the escarpment you reach the turnoff to Mana Pools 16 km from Marongora where you obtained your permit. The distance to Nyamepi Camp and the reception office is 72 km and could take up to 2 hours to reach. Although most types of vehicles can negotiate most of the roads in the park, care should be taken especially at the sandy river crossings. The 220 000 ha Mana pools National Park lies in the north of Zimbabwe between the Rukomechi and Sapi rivers. The Zambezi River forms the northern boundary and the Zambezi Escarpment the southern. 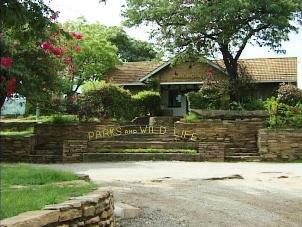 Huge herds of elephant and buffalo occur in the park and lion, waterbuck, zebra and impala are plentiful. Nearly 400 species of bird have been recorded in the area. Open in the dry months from May to October Mana Pools is one of the most untamed areas of the country and tourist is still allowed to walk away from his vehicle through tall open forest of mahogany and acacia. Elephant and lion are common residents so walkers need to be alert. The Zambezi valley is one of the low-lying areas of the country with very high temperatures in the summer. The best times to visit are the late winter or spring months when the temperatures are milder. During the dry winter months the animals concentrate round the water holes and the banks of the Zambezi. The veld is dry and brown with little or no grass. When the rains comes, normally in early November, the land is suddenly transformed into a green haven. The flood plains become carpeted with lush green grass. The whole area resembles an enormous park. During this time the large pools along the banks of the river, which give the area its name, fills up from the heavy rains.